Thus if a stranger sought out in good season the people and places described here they would probably seem clearly similar to their pictures, and the stranger would assume that the pictures mirrored real life. It would be marvellous if this were the case, if the place itself, and not merely the pictures, were the work of art. It would be marvellous to think that the ordinary, vernacular life in and around Memphis might be in its quality more sharply incised, formally clear, fictive, and mysteriously purposeful than it appears elsewhere, endowing the least pretentious of raw materials with ineffable dramatic possibilities. Unfortunately, the character of our skepticism makes this difficult to believe; we are accustomed to believing instead that the meaning in a work of art is due altogether to the imagination and legerdemain of the artist. I once heard William Eggleston say that the nominal subjects of his pictures were no more than a pretext for the making of color photographs - the Degas position. I did not believe him, although I can believe that it might be an advantage to him to think so, or to pretend to think so. To me it seems that the pictures reproduced here are about the photographer's home, about his place, in both important meanings of that word. One might say about his identity. If this is true, it does not mean that the pictures are not also simultaneously about photography, for the two issues are not supplementary but coextensive. Whatever else a photograph may be about, it is inevitably about photography, the container and the vehicle of all its meanings. Whatever a photographer's intuitions or intentions, they must be cut and shaped to fit the possibilities of his art. Thus if we see the pictures clearly as photographs, we will perhaps also see, or sense, something of their other, more private, willful, and anarchic meanings. Photography is a system of visual editing. At bottom, it is a matter of surrounding with a frame a portion of one's cone of vision, while standing in the right place at the right time. Like chess, or writing, it is a matter of choosing from among given possibilities, but in the case of photography the number of possibilities is not finite but infinite. The world now contains more photographs than bricks, and they are, astonishingly, all different. Even the most servile of photographers has not yet managed to duplicate exactly an earlier work by a great and revered master. The reader can demonstrate the point by clicking off a roll with the family Instamatic or Leica without moving from his chair: point the machine at random this way and that, quickly and without thought. When the film is developed every frame will define a subject different from any defined before. To make matters worse, some of the pictures are likely to be marginally interesting. Even the automatic cameras that record the comings and goings in banks describe facts and relationships that surprise mere eye-witnesses. It is not easy for the photographer to compete with the clever originality of mindless, mechanized cameras, but the photographer can add intelligence. By means of photography one can in a minute reject as unsatisfactory ninety-nine configurations of facts and elect as right the hundredth. The choice is based on tradition and intuition - knowledge and ego - as it is in any art, but the ease of execution and the richness of the possibilities in photography both serve to put a premium on good intuition. The photographer's problem is perhaps too complex to be dealt with rationally. This is why photographers prowl with such restless uncertainty about their motif, ignoring many potentially interesting records while they look for something else. The American photographer Robert Adams has written about this process of prowling, and its purpose: "Over and over again the photographer walks a few steps and peers, rather comically, into the camera; to the exasperation of family and friends, he inventories what seems an endless number of angles; he explains, if asked, that he is trying for effective composition, but hesitates to define it. What he means is that a photographer wants form, an unarguably right relationship of shapes, a visual stability in which all components are equally important. The photographer hopes, in brief, to discover a tension so exact that it is peace. PICTURES THAT EMBODY THIS CALM ARE NOT SYNONYMOUS, OF COURSE, WITH WHAT WE MIGHT SEE CASUALLY OUT OF A CAR WINDOW (THEY MAY, HOWEVER, BE MORE EFFECTIVE IF WE CAN BE TRICKED INTO THINKING SO). THE FORM THE PHOTOGRAPHER RECORDS, THOUGH DISCOVERED IN A SPLIT SECOND OF LITERAL FACT, IS DIFFERENT BECAUSE IT IMPLIES AN ORDER BEYOND ITSELF, A LANDSCAPE INTO WHICH ALL FRAGMENTS, NO MATTER HOW IMPERFECT, FIT PERFECTLY. ​Form is perhaps the point of art. The goal is not to make something factually impeccable, but seamlessly persuasive. In photography the pursuit of form has taken an unexpected course. In this peculiar art, form and subject are defined simultaneously. Even more than in the traditional arts, the two are inextricably tangled. Indeed, they are probably the same thing. Or, if they are different, one might say that a photograph's subject is not its starting point but its destination. In practice it works like this: the photographer cannot freely redispose the elements of his subject matter, as a painter can, to construct a picture that fits his prior conception of the subject. Instead, he discovers his subject within the possibilities proposed by his medium. If the broad landscape refuses to compose itself economically within the viewfinder's rectangle, the photographer contrives a different but consonant subject, composed perhaps of two trees and a rock. In historical terms it was perhaps not until the time of Alfred Stieglitz and Eugene Atget that photographers of exceptional talent learned to use the entire plate with consistent boldness. The new graphic economy that characterises the best photography of the early years of the century could be described in terms of the conventional concept of Composition, but it is perhaps more useful to think of it as the result of a new system of indication, based on the expressive possibilities of the detail. Gifted photographers, learning from the successes of their predecessors, quickly acquire the ability to recognise and anticipate certain aspects of subject matter, situation, perspective, and quality of light that might produce effective pictures. Original photographers enlarge this shared sense of possibilities by discovering new patterns of facts that will serve as metaphors for their intentions. The continuing, cumulative insights of these exceptional artists have formed and reformed photography's tradition; a new pictorial vocabulary, based on the specific, the fragmentary, the elliptical, the ephemeral, and the provisional. This new tradition has revised our sense of what in the world is meaningful and our understanding of how the meaningful can be described. Imagine then, after the photographer had spent a century learning how to use his medium in monochrome, what chaos resulted when he was suddenly presented with cheap and virtually foolproof colour film. The technical geniuses who developed this wonderful advance assumed, naturally, that more was better, and that the old pictures plus colour could only be more natural. The photographers understood that the old pictures were not natural to begin with, but were merely conceits, black-and-white photographs, infinitesimal bits of experience chosen because they looked good, and seemed to mean something, as pictures. For the photographer who demanded formal rigour from his pictures, colour was an enormous complication of a problem already cruelly difficult. And not merely a complication, for the new medium meant that the syntax the photographer had learned - the pattern of his educated intuitions - was perhaps worse than useless, for it led him toward the discovery of black-and-white photographs. Most serious photographers, after a period of frustrating experimentation, decided that since black and white had been good enough for David Octavius Hill, Brady, and Stieglitz, it was good enough for them. Professionals used colour when they were paid to, doing their very best, without quite knowing what they meant by that. Considering the lack of enthusiasm and confidence with which most ambitious photographers have regarded colour, it is not surprising that most work in the medium has been puerile. Its failures might be divided into two categories. The more interesting of these might be described as black-and-white photographs made with colour film, in which the problem of colour is solved by inattention. The better photographs of the old National Geographic were often of this sort: no matter how cobalt the blue skies and how crimson the red shirts, the colour in such pictures is extraneous-a failure of form. Nevertheless such pictures are often interesting, even if shapeless and extravagant, in the same way that casual conversation is often interesting. The second category of failure in colour photography comprises photographs of beautiful colours in pleasing relationships. The nominal subject matter of these pictures is often the walls of old buildings, or the prows of sailboats reflected in rippled water. Such photographs can be recognised by their resemblance to reproductions of Synthetic Cubist or Abstract Expressionist paintings. It is their unhappy fate to remind us of something similar but better. The conspicuous successes of colour photography are not many, and most of these have depended on a high degree of prior control over the material photographed. The still lifes of Irving Penn and the portraits of Marie Cosindas, for example, are masterly studio constructions, designed to suit the preferences of the camera. Outside the studio, where such control has been impossible, colour has induced timidity and an avoidance of those varieties of meaning that are not in the narrowest sense aesthetic. Most colour photography, in short, has been either formless or pretty. In the first case the meanings of colour have been ignored; in the second they have been considered at the expense of allusive meanings. While editing directly from life, photographers have found it too difficult to see simultaneously both the blue and the sky. But what is at a given moment too difficult can bit by bit be grasped, and finally become possible. Clues garnered from a million failures and apparently unrelated successes educate the intuition and make possible deductive leaps to progressively complex syntheses. The clues that have been of use to today's colour photographers are labyrinthine and nearly untraceable, but have surely included modern painting, colour movies and television, drugstore postcards, and the heterogeneous flood of imagery that has come from the modern magazine. In the past decade a number of photographers have begun to work in colour in a more confident, more natural, and yet more ambitious spirit, working not as though colour were a separate issue, a problem to be solved in isolation (not thinking of colour as photographers seventy years ago thought of composition), but rather as though the world itself existed in colour, as though the blue and the sky were one thing. The best of Eliot Porter's landscapes, like the best of the colour street pictures of Helen Levitt, Joel Meyerowitz, Stephen Shore, and others, accept colour as existential and descriptive; these pictures are not photographs of colour, any more than they are photographs of shapes, textures, objects, symbols, or events, but rather photographs of experience, as it has been ordered and clarified within the structures imposed by the camera. It could be said - it doubtless has been said - that such pictures often bear a clear resemblance to the Kodachrome slides of the ubiquitous amateur next door. It seems to me that this is true, in the same sense that the belles-lettres of a time generally relate in the texture, reference, and rhythm of their language to the prevailing educated vernacular of that time. In broad outline, Jane Austen's sentences are presumably similar to those of her seven siblings. Similarly, it should not be surprising if the best photography of today is related in iconography and technique to the contemporary standard of vernacular camera work, which is in fact often rich and surprising. The difference between the two is a matter of intelligence, imagination, intensity, precision, and coherence. If it is true, as I believe it is, that today's most radical and suggestive colour photography derives much of its vigour from commonplace models, this relationship is especially strong in the case of Eggleston's work, which is consistently local and private, even insular, in its nominal concerns. The work seen here, selected from an essay of 375 pictures completed in 1971, is on the surface as hermetic as a family album. It is true that much of the best photography of this century has been created from materials that one would, from an objective, historical perspective, call trivial, for example, the wheel and fender of a Model T Ford, or the face of an anonymous sharecropper, or the passersby on an urban sidewalk; but these materials, even if slight in terms of their intrinsic, specific importance, are nevertheless public and potentially exemplary, and thus available as the carrier of symbolic freight. Eggleston, however, shows us pictures of aunts and cousins and friends, of houses in the neighbourhood and in neighbouring neighborhoods, of local streets and side roads, local strangers, odd souvenirs, all of this appearing not at all as it might in a social document, but as it might in a diary, where the important meanings would be not public and general but private and esoteric. It is not clear whether the bucolic modesty of the work's subject matter should be taken at face value or whether this should be understood as a posture, an assumed ingenuousness designed to camouflage the artist's Faustian ambition. Preoccupation with private experience is a hallmark of the romantic artist, whose view is characteristically self-centered, asocial, and, at least in posture, antitraditional. If Eggleston's perspective is essentially romantic, however, the romanticism is different in spirit and aspect from that with which we are familiar in the photography of the past generation. In that more familiar mode, photographic romanticism has tended to mean the adoption and adaptation of large public issues, social or philosophical, for private artistic ends (an activity that might be termed applied romanticism, as distinct from pure Wordsworthian independence), and it has generally been expressed in a style heavy with special effects: glints and shadows, dramatic simplicities, familiar symbols, and idiosyncratic technique. In Eggleston's work these characteristics are reversed, and we see uncompromisingly private experience described in a manner that is restrained, austere, and public, a style not inappropriate for photographs that might be introduced as evidence in court. Those of us with a limited appetite for the colour slides made by our own friends, pictures showing people and places that we cherish, may be puzzled by experiencing a deeper and more patient interest in the pictures of unfamiliar people and places that are reproduced here. These subjects appear to be no more overtly interesting or exotic than those in our own family albums, nor do they identify themselves as representatives of a general human condition. They are simply present: clearly realized, precisely fixed, themselves, in the service of no extraneous roles. Or so the photographs would have us believe. In truth the people and places described here are not so sovereign as they seem, for they serve the role of subject matter. They serve Eggleston's interests. The simplicity of these pictures is (as the reader will have guessed) not so simple. When Alfred H. Barr, Jr., first saw a selection of slides from this series in 1972 he observed - surprisingly but in fact accurately - that the design of most of the pictures seemed to radiate from a central, circular core. In time the observation was relayed to Eggleston, who replied, after a barely perceptible hesitation, that this was true, since the pictures were based compositionally on the Confederate flag - not the asterisk, or the common daisy, or the dove of the Holy Ghost, but the Confederate flag. The response was presumably improvised and unresponsive, of interest only as an illustration of the lengths to which artists sometimes go to frustrate rational analysis of their work, as though they fear it might prove an antidote to their magic. Barr's comment however is valuable, and suggests in concrete terms a quality central to Eggleston's work: a lean, monocular intentness that fixes the subject as sharply as if it were recalled from eidetic memory. Reduced to monochrome, Eggleston's designs would be in fact almost static, almost as blandly resolved as the patterns seen in kaleidoscope&, but they are perceived in colour, where the wedge of purple necktie, or the red disk of the stoplight against the sky, has a different compositional torque than its equivalent panchromatic gray, as well as a different meaning. 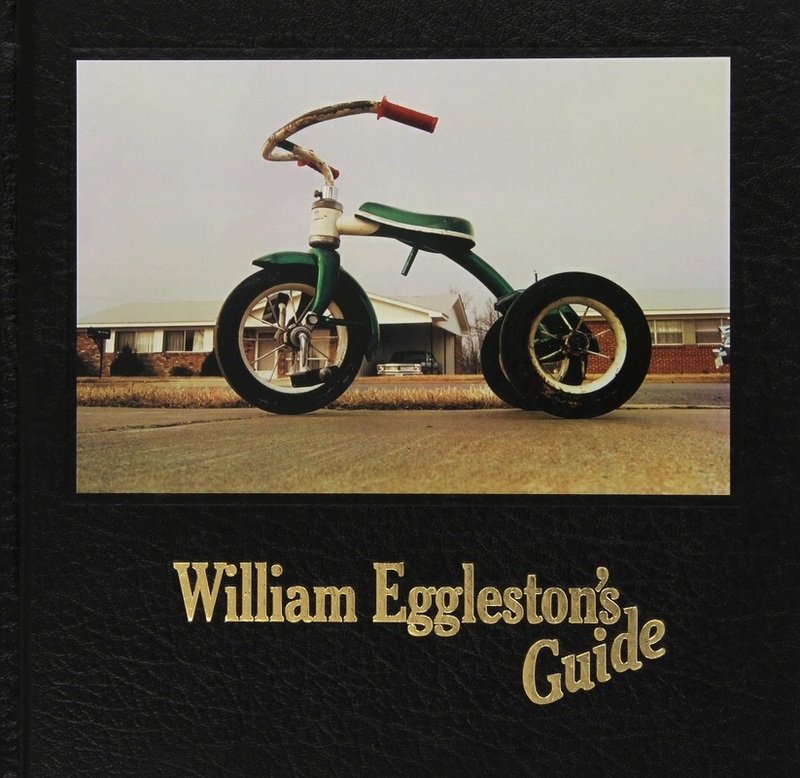 For Eggleston, who was perhaps never fully committed to photography in black and white, the lesson would be more easily and naturally learned, enabling him to make these pictures: real photographs, bits lifted from the visceral world with such tact and cunning that they seem true, seen in color from corner to corner. For many excellent reasons, most of which involve the financial problems of book publication, it would be convenient if one could claim, or suggest, that this book of photographs answers, or contributes to the answer of, some large social or cultural question, such as, Whither the South? or Whither America? depending on one's viewing distance. The fact is that Eggleston's pictures do not seem concerned with large questions of this sort. They seem concerned simply with describing life. This does not advance us very far, since it is difficult to conceive of a picture that does not in some sense describe life. That encompassing motif is itself so broad and hopelessly unformed, with so many aspects, angles, details, sotto voce asides, picturesque subplots, and constantly shifting patterns - and none of this clearly labeled - that in fact only the description itself identifies the thing described, and each new description redefines the subject. It is not possible to describe one subject in two different ways. One can say then that in these photographs form and content are indistinguishable - which is to say that the pictures mean precisely what they appear to mean. Attempting to translate these appearances into words is surely a fool's errand, in the pursuit of which no two fools would choose the same unsatisfactory words. One can say, to repeat, that in Eggleston's pictures form and content are indistinguishable, which seems to me true but also unsatisfactory because too permissive. The same thing can be said of any picture. The ambitious photographer, not satisfied by so tautological a success, seeks those pictures that have a visceral relation to his own self and his own privileged knowledge, those that belong to him by genetic right, in which form matches not only content but intent. This suggests that the pictures reproduced here are no more interesting than the person who made them, and that their intelligence, wit, knowledge, and style reach no farther than that person's - which leads us away from the measurable relationships of art-historical science toward intuition, superstition, blood-knowledge, terror, and delight. These pictures are fascinating partly because they contradict our expectations. We have been told so often of the bland, synthetic smoothness of exemplary American life, of its comfortable, vacant insentience, its extruded, stamped, and moulded sameness, in a word its irredeemable dullness, that we have come half to believe it, and thus are startled and perhaps exhilarated to see these pictures of prototypically normal types on their familiar ground, grandchildren of Penrod, who seem to live surrounded by spirits, not all of them benign. The suggestible viewer might sense that these are subjects capable not only of the familiar modern vices (self-loathing, adaptability, dissembling, sanctimony, and license), but of the ancient ones (pride, parochial stubbornness, irrationality, selfishness, and lust). This could not be called progress, but it is interesting. Such speculations, however, even if not simple nonsense, presumably relate only to Eggleston's pictures - patterns of random facts in the service of one imagination - not to the real world. A picture is after all only a picture, a concrete kind of fiction, not to be admitted as hard evidence or as the quantifiable data of social scientists. As pictures, however, these seem to me perfect: irreducible surrogates for the experience they pretend to record, visual analogues for the quality of one life, collectively a paradigm of a private view, a view one would have thought ineffable, described here with clarity, fullness, and elegance. 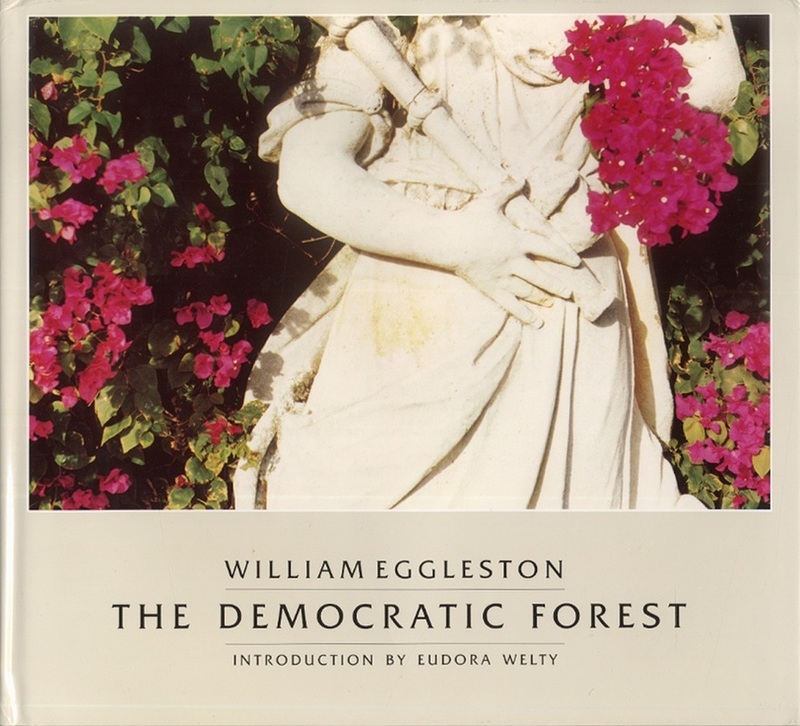 ​You might also be interested in Eudora Welty's introduction to and William Eggleston's own afterword to his book The Democratic Forest in which he describes his approach to photographing democratically.